My life, under the microscope...: git yer hands on this give-away! Okay, I get it. Most people aren't buying paintings these days. How bout if I just give you one? Here's your chance to get some chicken art at absolutely no cost! See, there was one framed piece from the gallery show. They framed it. The rest are all on Etsy now but it's sort of a "one of these things is not like the other" situation. I wanted ALL of them to be the same price, and this one would be more (because I paid to have it framed, sigh). So what the heck, I'm just going to give it to someone. - If we don't know each other, then how you found my blog. - Just introduce yourself, if you haven't already, you bunch of lurkers, I know you're out there. Some bloggers get all the hype, I just ramble off into cyberspace, sigh. - Give me a recipe. Nothing with sauerkraut, marzipan, mushrooms, or olives. Yeah, there you go, it's that simple. I will use random.org (thank you Heather P for the idea!) to pick a winner some time after 10pm on Monday August 24th. Even if you comment more than once, you only get one "entry." Oh hey, you want to know what you're trying to win don't you?! It's #49 from the 50-50 Show, it's a Blue Andalusian rooster. Acrylic paint on masonite, framed. The painting is 6x6 inches, the whole frame is 12x12, and framed with glass (I think it's glass rather than plexi). [EDIT] Okay, new rule, whoever wins needs to contact me within ten days of winning. Winners will only be notified by me posting it here, so if you don't check back, well, you forfeit! Katherine. This is Brian Powley. I first saw your work on the engraving forums and became a fan instantly. It was a thrill to meet you in Reno and glance at your artwork "Up Close and Personal." I knew your art would be so much better than what I saw in the photo postings. I wasn't disappointed. I would put it in my private collection that includes Ron Smith's Stetson cowboy hat and handwritten letters from Don Glaser, the inventor/founder of GRS. You have a great future ahead of you. It's nice to see such passion. Holy Cow! What an opportunity! You bet I am going to give it whirl! This is Brigid McCrea and I know you since Dr. B's AVS 11 class in 1998(?). I think we went to some of the same shows and we never chatted b/c of someone's innate shyness. My chicken story: I started by showing chickens from my mechanic J.M. who raised white-crested black Polish and was an APA judge. I love your artwork although I don't think I am lurker. Buy maybe I am a poultry art lurker? I dunno. Okay, now for the recipe. Of course I would think of a wierd recipe that is the complete opposite of what you want. I was thinking of Mushroom and Saurkraut stuffed Marzipan that is shaped and painted to look like an olive! How's that for very, very gross! I bet is exactly what would cure your thumb though! Better go make some and eat it so you can get back to work on scrimshaw. BTW- your colored scrimshaw is one of my favorites and I am saving up to have something chicken-ish made in scrimshaw. Oh yeah - why do I want to win? 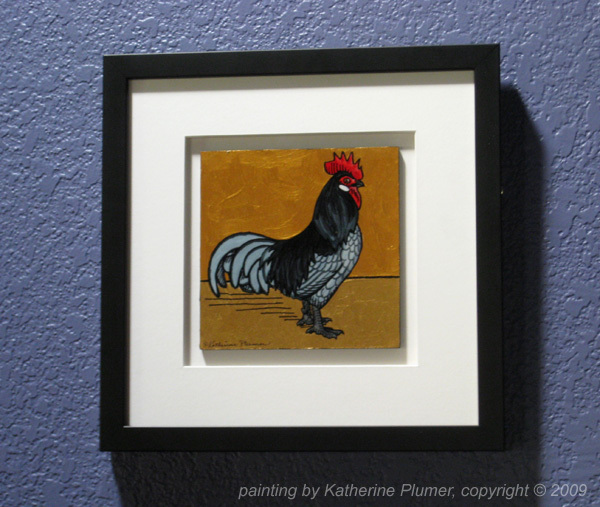 B/c Katherine Plumer's artwork is the best in the poultry world, hands down! End of story, one look and you know it is true! Thanks for letting me ramble on YOUR blog! I live in an urban neighborhood in Seattle with my wife, daughter and 4 chickens! We love our birds (2 Arucana-mixes and 2 Delawares) and we have become very fond of chicken related art. We'd love to hang this painting in our house, within view of the coop! P.S. I used to post photos of my chickens on my blog, but it has evolved into "Chicken Corner," in which I post little events from the wide chicken world. Check it out. Oh Geez! I don't have a chicken story, other than loving to eat them. Is that wrong? I'm hoping it's still okay. Pick me. it won't let me log in, but this is heather. I'd love to win a chicken piece from you Katherine! I have two katherine originals that I treasure, but I'm not enough of a chicken fan to justify buying a framed chicken painitng. I would disply it proudly! I ran into your blog by accident - what a glorious accident! Your talent is amazing! I don't know you IRL - so a chicken story... I have a lot (see blog!) - but how about: last year I had to get a cast for my ankle and my doctor said "whenever you're outside, put a bag over the cast so it doesn't get too dirty." So I went home, grabbed a (gasp) plastic grocery bag from my recycling bag and put it over my walking cast. Out to the coop I went to check for eggs. The girls were free ranging and Henrietta (one of my RIR's) followed closely. For one split second I had to lift my bagged and casted foot and Henrietta snatched the bag and went running away at breakneck speed. She thought she had a treat! That was the last time I worried about keeping the cast clean! Why would I like to win? Who wouldn't?! But seriously - my heart skipped a beat at the beautiful Blue! I ordered 5 Blue Adalusians this spring - pullets, of course, one was a Roo. Sadly, we aren't able to keep a rooster, so he had to live in the country on a REAL farm. I love the Blues! And your gift is amazing. I'd be truly honored to hang your work on my wall! I saw an article in PPress mentioning this new young artist was doing art for additions to THE Standard. I thought, "Wow, a new generation had picked up the torch to carry on some 20 years after.."
And your work was great!!!! So immediately I e-mailed you with glowing praise and asked a million questions. Of course, I received no answer!!! I guess Stockton(where you should have won!!!) was when we actually met...but I considered you a friend well before then. Thanks for your blog, and try to raise more Rosecombs. My wife and I will be at Ventura this year(also the Reagan pres library...ta da! )Hope to see you. I will close with...Never go up against a Sicilian with death on the line!and stay away from ROUS with your thumb out of joint. We met on LiveJournal, each making comments on a chicken-related community. But the great thing was, as you know, that you asked if I might come to the APA National in Ventura, purely as a joke, I think, but I decided to go. What a wonderful weekend and what a pleasure to meet you (and Dan) in person. Hey its Brittney from FaceBook. Saw the link on there, figured since you do wonderful work, I wanted to see what this painting was. My husband and I are buying our first home in 2 weeks and are doing a country theme. This would be perfect for our house. We are moving because we have 3 boys with a terminal illness - ages 3 1/2, 2, and 7 months. My entire kitchen has roosters in it and this would fit perfect. This is Ellie Hamblen, down here in "Chickentown L.A."! You wanna chicken story? ?A client of mine was moving and asked if I wanted any of her chickens, which were Jap bantam crosses. Well, I really didn't, but I couldn't leave the little forlorn hen with one useless leg and a perpetually bewildered look on her face. She would always stand in one place, and roost outside the coop on an upside-down barstool. So, she came home with me. Once the leg mites and the crusty stuff came off the legs, well, the toes on the bad foot were black. So, off to the vet we go for hen toe amputation. Three of them. Now named "Stumpy", her foot recovered great and she used the leg again, no problem!So I was glad that the little gal got fixed up, and hangs out with the modern hens. You really wouldn't want a recipe from me. I'll do you a favor and skip that one! Why would I want some of your chicken art? Another wonderful reminder of my chicken Friend in California. When did we meet - I plead the fifth on that because I don't really want to admit how old I have become. i love chickens. there's nothing like snuggling a nice warm hen on a cold new england day. i'm a riding instructor, and i did my apprenticeship at a stable that kept chickens (as well as bunnies and duckies and of course horses). the chickens were great, they kept the ticks to a manageable level. they were also great for teaching our students certain lessons about moving quietly, gently, and with purpose. few chickens (none i've met) would come into your arms of their own force, like cockatoos. you had to be persistent with these chickens, but not imposing, or they'd be out of there. (i suppose this is a survival trait in a species that's been food for so long.) and once you have the creature, you have to convince it that it isn't about to meet its demise, just some nice scritching and exchange of mutual warmth. if you could do that, you'd be rewarded with a warm, soft, happy companion for a little time. or i might keep it. i have a streak of selfish and i love chickens too, and you're by far the best chicken artist i've ever encountered. when i try to explain livejournal to people aren't familiar, you're one of the examples i use -- no, i don't think we've ever met. but you post chicken art! and coyote art! and it TOTALLY MAKES MY DAY!! either they get it then, or they just think i'm nutty anyway. This contest is now closed! Thanks for playing! Winner will be announced soon.